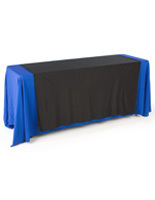 Table Runners are only 1 of 100 Models Available from the Web's Largest Online Warehouse! Table skirts are brought to a new level when displayed with these table runners. 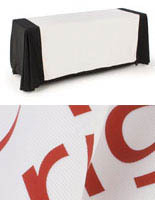 These affordable table covers or overlays are great for dressing up a registration or trade show table. 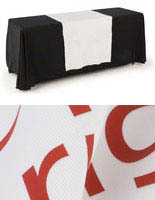 These fire-retardant table runners are shipped with certification from an independent testing facility. Having the documented certification means your ready for the Fire Marshal at your next trade show. 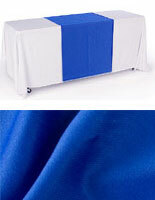 We sell these table skirt accessories just as they are or with custom imprinting. In addition, our skirts and runners are machine washable, which is an important detail when you are purchasing white linens. Had a spill? Just wash and iron and you're ready for your next trade show. 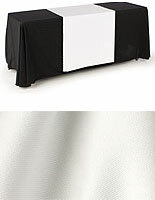 Add that little extra to your trade show exhibit when you combine table skirts with stylish runners! 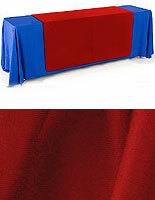 These tablecloth accents, table runners are not designed to cover a table completely. They are accent pieces that drape over the top of a tablecloth. 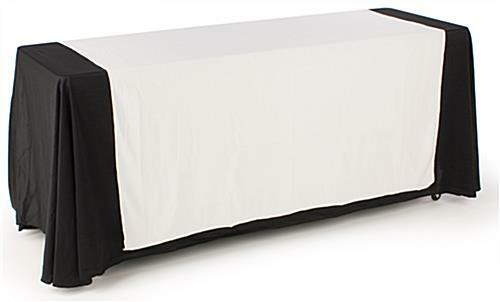 Use this white table runner with any contrasting color table skirt for an eye-catching display. At 80" long, these table runners fit any size table. 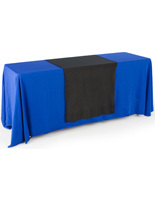 These table throws are some of our most popular items and are the easy way to add style to a trade show exhibit or banquet hall.